Following the Great Freeze of 1894-95 a series of studies performed by scientists, botanists, and horticulturists, between the USDA-ARS programs and the UF/IFAS Citrus Experiment Station, now called the Citrus Research and Education Center (CREC) in Lake Alfred as well at other research centers made leaps and bounds in research and technology, especially in nutrient replacement in citrus cultivation. Through this research, the essential macronutrients and micronutrients were studied for healthy grove production. Treatment incorporated organic methods such as animal manures, biosolids, and composts, as well as inorganic methods including chemicals sprays. Chemical studies on citrus groves by Michael Peech and T.W. Young showed that Florida’s sandy soils are unfavorable and naturally infertile with low capacities for retaining plant nutrients, water, and agrichemicals. Sulfur was also discovered to be essential but no deficiency was found because the nutrient was present in rainfall, irrigation water, sprays, and fertilizers. In 1939 A.F. Camp and B.R. Fudge also realized that there are secondary and micronutrients needed including copper (Cu), zinc (Zn), manganese (Mn), magnesium (Mg), boron (B), and iron (Fe). They presented means to correct the deficiencies (except iron, since no known method had been discovered that was an efficient fertilizer during that time). Yellow spot disease appeared in 1908, however, it wasn’t until the discovery by Ivan Stewart and C.D. Leonard in 1951 that molybdenium deficiency was realized as the cause. Fertilizer applications with 1 ounce of sodium molybdenate per acre corrected the problem. W.F. Spencer and R.C.J. Koo planted citrus groves at the experiment station without calcium resulting in stunted trees with leaves symptomatic of calcium deficiency. Unbeknownst to early growers, copper deficiencies resulted in limited growth and production and were combated with foliar and soil applications of fertilizer. Researchers, along with the work of I.W. Wander, learned that copper was not absorbed via uptake or leached into soil, which resulted in accumulation on soil surface. Over time this caused copper build-up, which in turn interfered with iron uptake, triggering leaf chlorosis and defoliation. Tree removal in the 1950s was how growers handled the problem, but the studies of Stewart and Leonard revealed that the solution was to apply organically chelated-iron (iron-EDTA) to the soil. The Citrus Experiment Station and USDA Horticultural Laboratory Scientists distributed the first comprehensive guide of fertilization, Bulletin 536, in 1954. Based on field experiments and gathered data, 11 essential elements were recommended including rates and sources that were utilized for the next 41 years on citrus tree nutrition. In the 1960s, the CREC recommended growers convert to high analysis fertilizers, which would aid in elimination of mixing costs, transportations, and reduce application costs. Over the next 20 years, UF/IFAS and the USDA performed extensive research, such as on nitrogen fertilizer and timing for different soils, the tree’s age, varieties, rootstocks, and cultural conditions. In the late 1980s, a new movement in citrus cultivation began with the “Best Management Practices (BMP) Era.” The Florida Department of Agriculture and Consumer Services (FDACS) implemented the voluntary BMP of nitrogen fertilization on the Ridge to protect water quality. BMP manuals were written for Indian River, Peace River, and Gulf production areas extending nutrient management to include irrigation and drainage management, erosion prevention, pesticide use, and aquatic weed control. Today all these regional BMP manuals for citrus production in Florida have been incorporated into a single BMP manual for Florida citrus production. The “Squeeze” on Florida’s Citrus History: In most seasons, more than 90 percent of America’s orange juice is made from Florida-grown oranges. Texture: sand, silt, clay in mineral soil. Organic matter: organic carbon-based material from fresh plant residues and highly decomposed humus or compost. Water-holding capacity: requires small and frequent irrigation to combat nutrient leaching. pH: phosphorus (P), calcium (Ca), magnesium (Mg) and micronutrients balance affect availability and uptake. Florida soils are acidic in native state and require lime fertilization applications. Soil pH of 6.0-6.2 is the optimal range for citrus. Lime application and fertilizers are not necessary for calcareous soils and are an exception with their natural pH of approximately 8.2. Cation exchange capacity (CEC): measures the soils ability to retain nutrients; the greater the CEC, the greater the soil’s fertility. Coated and non-coated soils: indicate P fixation, which is an environmental concern and important to know its movement from agricultural fields to surface water. Some Florida soils contain adequate sand coated with iron and or aluminum compounds that enable absorption of P.
Another important factor in modern water and nutrient management is that different size trees need different fertilization amounts. Current citrus diseases, such as blight and citrus greening, have contributed to tree removal and a new citrus tree being planted in place of the removed tree. Variable Rate Fertilization (VRF) is precision agricultural technology that measures and forecasts crop properties in real-time with embedded high-speed computers, accurate Global Positioning Systems (GPS), Geographic Information Systems (GIS), remote sensing, yield or soil maps, actuators, and electronic sensors. VRF’s prime function is to detect and avoid fertilizing empty spaces in groves, as well as the ability to change the rate of fertilization for trees that are different sizes (a younger tree that recently replaced another might be next to a more mature tree, and the rate of fertilization would be different for each one). It exploits crop and soil variability thus enabling resets and smaller trees to be fertilized at optimal rates. A key component of this new technology is the precision agricultural distribution of liquid and solid materials to site-specific locations, facilitating maximum water and nutrient retention while improving uptake at the root zone of horticultural crops. The journey of citrus would once again change with the inception of new processing technology. By the 1920s the citrus industry had cultivated deep roots in its production. No longer were groves started from seedlings. Citrus would journey from nursery to field to packinghouse to the consumers’ pantry or freezer during off seasons. Initially, processing of citrus was intended for the useful disposal of fruits, such as grapefruit and other less popular fresh fruit. Physically unappealing fruit with blemishes, irregular sizes, and poor external appeal though retaining good internal quality were used for canning. Demand grew and the development of frozen and hotpack citrus juice concentrates continued to expand. The motivation to develop a better juice product with longer shelf life and year-round availability came with U.S. aid to Europe during World War II. Food products, including frozen concentrated orange juice (FCOJ), were shipped overseas for relief to children and lactating or expectant mothers. Florida Foods, which later became Minute Maid, was instrumental in marketing the product throughout the U.S. The Florida Citrus Commission and the USDA developed vacuum evaporation concentrate of five-to-eight-fold diluted with fresh juice three-to-four-fold and then frozen. 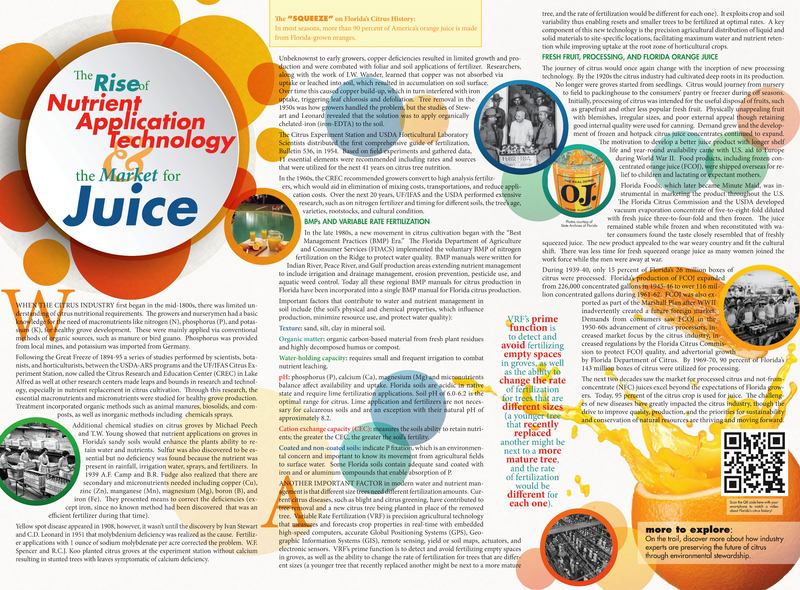 The juice remained stable while frozen and when reconstituted with water consumers found the taste closely resembled that of freshly squeezed juice. The new product appealed to the war weary country and fit the cultural shift. There was less time for fresh squeezed orange juice as many women joined the work force while the men were away at war. During 1939-40, only 15 percent of Florida’s 26 million boxes of citrus were processed. Florida’s production of FCOJ expanded from 226,000 concentrated gallons in 1945-46 to over 116 million concentrated gallons during 1961-62. FCOJ was also exported as part of the Marshall Plan after WWII inadvertently created a future foreign market. Demands from consumers saw FCOJ in the 1950-60s advancement of citrus processors, increased market focus by the citrus industry, increased regulations by the Florida Citrus Commission to protect FCOJ quality, and advertorial growth by Florida Department of Citrus. By 1969-70, 90 percent of Florida’s 143 million boxes of citrus were utilized for processing. The next two decades saw the market for processed citrus and not-from-concentrate (NFC) juices excel beyond the expectations of Florida growers. Today, 95 percent of the citrus crop is used for juice. The challenges of new diseases have greatly impacted the citrus industry, though the drive to improve quality, production, and the priorities for sustainability and conservation of natural resources are thriving and moving forward.